Payments don’t get a lot of attention among the C-suite. That’s not too surprising, since making payment happens long after strategic decisions are made. As long as cash flow is good, and vendors aren’t calling looking for their money, most executives assume all is well. It’s been decades since we’ve seen anything new in B2B payments, so there hasn’t been much for companies to improve. However, just as with consumer payments, financial technology companies, or fintechs, are reinventing business payments. Over the past couple of decades, we’ve seen an incredible amount of automation. Many executives don’t realize the extent to which accounts payable is still a paper-based world. We’ve had electronic payment methods—ACH, credit card, and wire—for such a long time that people assume their organizations are taking full advantage of it. While we’ve made some progress, U.S. companies still make an average of 51 percent of their payments by check. That means most AP departments are managing a patchwork of payment methods. A payment mix that is 50 percent paper-based with some ACH, credit card, and wires is far from efficient. When most people consider the inefficiencies of checks, they think about the printing, signing, envelope stuffing, stamping, and mailing. That’s the most obvious—and easiest part—because it lends itself to a predictable workflow. What happens on the back end is less predictable and perhaps even more time-consuming. At the very least, checks require manual reconciliation. And that’s assuming all goes well—that the payment is correct, arrives in the right hands, and is deposited in the supplier’s bank promptly. That’s a big IF because payment error rates are high. Up to 30 percent in some industries. When people compare the cost of checks to electronic payments, they’ll see that checks cost about ten times more, but that’s based on upfront check costs. Time spent chasing down and fixing errors on the back end is what drives up the cost of checks, sometimes to hundreds of dollars for a single erroneous payment. As organizations grow, so does the number of checks they’re handling. Up until recently, the only solution was to throw people at the problem. The early adopters of payment automation tend to be fast-growing companies faced with the prospect of hiring people just to handle a non-value-added task like check processing. That’s a ridiculous idea in 2017, so they look for a better solution. Payment automation software is designed to take entire payment workloads and make them simple. The software takes payment instructions out of the company’s accounting system and makes the payments on behalf of the company. It addresses 100 percent of the payment problem, freeing up teams to focus on value-added activities such as financial planning and analysis. Executives may think to turn to banks for help with payments. That’s understandable because until recently, there’s never been another place to go. While you may have a great relationship with your bank, they are not historically good at technology. What banks offer are a variety of payment products and programs—such as ACH, credit card, and wire transfers for international payments. They don’t provide anything to join those payment products in an automated workflow, plus they’re typically not a cost-effective provider. Money is the lifeblood of an organization, but organizations have long accepted that they don’t have great visibility into—or control over—the timing of payments. That’s not surprising when you’re making half your payments by check. Managing float is the time-honored way of sustaining cash flow. But once a check goes in the mail, you lose visibility and no longer know what’s happening with it. You’re either left in the dark until it clears your bank, or until you hear from someone that it didn’t get there, or the amount was wrong. Organizations that adopt payment automation solutions can see all of their payments at any given time. They gain visibility into their cash position at all times. They can hold payments longer, and pay minutes before they need to. They can manage cash with much more precision than previously imagined. Payment automation is cloud-based and works within the accounting system. It is a much more straightforward solution to implement—taking only 12 hours—in comparison to an ERP or other enterprise-grade automation solution—which may take six to 12 months to implement. People also think about automating things serially. The conventional wisdom, particularly in AP, is to start automating with invoice receipt and processing, and then think about paying digitally. The opposite is better because payments are far easier to automate—regardless of what’s upstream from it. You can take the cost savings—typically about $5 per payment—and invest it in automating the front end. You get a quick win with automated payments, and the resources to attack bigger, harder problems. Economists and the Federal Reserve are predicting two percent GDP growth for the next two to five years, and those projections seem reasonable. In an economy that’s not growing rapidly, it’s tough to break out and beat that growth number. One way to do it is to cut costs. Payments automation saves about 75 percent of AP costs. That improves the bottom line, but it’s nowhere near as hard as driving growth. Executives don’t think much about payments because they’re tactical and they have to happen, and the process is seen as a cost of doing business. Companies have been living for so long with the same broken, non-value-added process they’ve stopped thinking about it, and they’re unaware that there is now a better way. Newer companies that are thinking about scaling payments for the first time are already there. In a slow growth environment, automating non-value-added tasks is one way to grow the bottom line, while also opening up an advantage over companies that continue to do things manually. In that regard, automating payments is a golden opportunity you probably didn’t even know existed. For more information, visit www.nvoicepay.com. Karla received an MBA from Harvard Graduate School of Business and a BS in Accounting from University of Idaho. 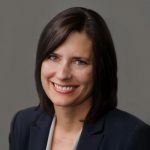 Karla Friede is Chief Executive Officer, co-founder, and member of the Board of Directors at Nvoicepay. She has 20 years of experience in management, finance, and marketing roles in both large and early stage companies. Along with the founding team, Karla has grown Nvoicepay into the leading B2B Payment Automation Software company.